Social media has the power to do a lot of good things for your brand. It can help you increase sales, build authority in your niche, increase website traffic, build valuable relationships, handle customer support and so on and so on. The list of benefits social media has for brands really is endless but still (unfortunately), some old-fashioned marketers are completely ignoring it. As social media has increased dramatically over the years, the competition of the audience’s time and a place in their feed has become much tougher. This is where effective and unique branding strategies can really set you apart from your competitors. Are you taking branding on social media very seriously and have a strategy for it? If the answer is no, learn these Top 5 Most Effective Social Media Branding Strategies and adapt them into your own strategy for social media success. Which social media platforms you use can have a lot to do with the success of your social media efforts. It’s easy to hop on all social media platforms available, in the belief that you get a bigger reach but that’s a completely wrong approach. All platforms are not suitable for all brands, and that has a lot to do with the demographics of the platform. It’s important to be aware of that the “one platform fits all” approach is an idea that isn’t something to go after. For example, Pinterest is known for attracting a female-dominated user base and according to a study made by comScore, 71 percent of Pinterest’s 72.5 million users are women. If you are a business who are selling beard supplies, Pinterest maybe isn’t the ideal platform where you should be putting your efforts on. If you, on the other hand, would be a brand who are selling clothes for men and women in the age of 20-35, you might find more success on Instagram as 90% of Instagram’s users are under 35. When it comes to brand message across platforms visual branding is the most important part of social media branding. There are brands who do this very well, and then there are brands who are doing it less successfully. Your brand should have a visual branding consistency across platforms that is so good that your brand’s page is instantly recognized, no matter what platform someone finds you on. Having this will make it more appealing for people to follow you on several platforms as your account is something familiar. Decide on a consistent color palette or filter. 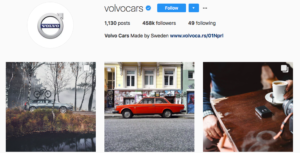 As you could see, Volvo uses very natural colors overall and the feeling they mediate to the viewer is the same on all their social media platforms. It’s clear that they are trying to display themselves as very modern, with very robust and Scandinavian objects in their visuals such as wood and bricks. The branding goes so much further than just the logo that is the same on all accounts. It also looks like Volvo have edited their photos in the same way or added the same filter on all of them because even though there are warm colors in the images, the overall feeling is that it is a cold image, so think about what colors you are displaying your brand with. 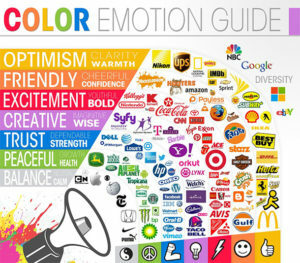 Take a look at the color physiology guide below and think about what you want to meditate to your audience with your visuals on social media. Use or don’t use filters. It’s important that you keep your visuals consistent, and adding filters can change how an image is seen. That’s why it’s important that you decide if you are going to use filters or not from the very beginning. If you do decide on use filters, use the same filter (or a few that are similar) on all your images, as this will create a connection between your posts. Using similar filters can help your visuals become easily recognizable. If you, on the other hand, would use different filters, it will make your visuals look incoherent and unconnected. 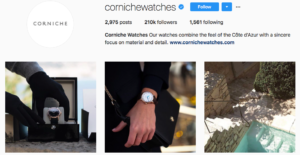 On brand that has succeeded very well with this is the watch brand Corniche. Their social media pages send a consistent brand message with strongly connected visuals. If you take a look at their Instagram page, for example, it’s very clear that the visual branding is well planned and thought of, based on what they want to mediate to their followers. Use the same font. If you are using text on your images, make sure you are using the same font for all your text. This is another very effective way to quickly create a coherent brand message. Have the same logo. This one is a given, but I see this mistake being made by brands every now and then on social media. Always use the same logo for all you social media networks. Your logo should be instantly recognized and associated with your brand. When someone sees your logo, people should instantly come to think of your brand. That’s why it’s important to use it often and consistently. One very easy way to increase your brand awareness is to add your logo as your profile picture on all your social media pages. The way you speak to your audience should depend a lot on who your target audience are. It is important that you are reflecting your brand’s personality and what you stand for with your social media messages. Apart from the visuals themselves, this is more about what you write in the captions. This one is a bit trickier to do but once you know how to do it, it will become second nature. The way you write and what language you are using in the captions should reflect who you are trying to reach. If you’re targeting CEO:s, having a more proper and “serious” language and tone might be more appropriate – simply because that’s the language the audience you’re trying to target is using. For example, it is very clear that Froosh Smoothies want to display themselves as a playful company. In this case, emojis helps improve their brand language. While this may not work for all brands, it certainly works for a brand like Froosh. If younger generations are your target audience, talking to them about popular trends that are relevant to them helps you get on their level, giving you a bigger influence. 2. How are you using your language? Speaking a certain language just because your target audience does is a big no. It’s important that your message feels authentic for you to gain any trust. Writing in a language that you don’t really master just to meet your audience’s needs isn’t a recipe for success. Instead, it can decrease your authority and harm the trust people have to your brand. Think about it like this: If your grandmother or grandfather tries to speak the same language as 20-year olds, it will be very easy to see through, resulting more in the opposite of what they’re trying to achieve, speaking that language. Avoid going too broad with the content you’re sharing. Instead, focus on a few topics related to your niche and go with those. Knowing what topics you should focus on also helps you share more quality content on social media. By simply focusing a few subjects that are closely related to your niche, your audience will have an easier time knowing what to expect from you, thereby resulting in a more targeted following. Limit yourself to a maximum three topics that are somewhat related to each other and your niche. For example, SEO, internet marketing, and social media marketing. Influencers are already established profiles in the social media world. Influencers have built trust and authenticity over a long period of time to an audience that looks up to them and trusts their words. If you want to have a shot at competing with the big fish, taking help from influencers can help you achieve your goals quicker while. at the same time helping brand and portray your brand just the way you want it to be seen. The most important part here is that you partner with influencers who speaks the same language as you, as these individuals already have a following that speaks the same language as you! It goes in three steps, but getting recommendations from people with a lot of trusts can skyrocket your authenticity in a very short period of time. Finding suitable influencers for your brand can be a difficult task. Marketers have identified finding suitable influencers is one of the most difficult tasks when it comes to launching influencer marketing campaigns. It doesn’t have to be difficult to identify influencers who fulfills all your criteria. Veloce Network is a social media influencer directory that has gathered thousands of influencers in one place. What makes it so difficult is that there are so many things you have to take into consideration when picking your influencer. Veloce Network is influencer marketing simplified. Simply filter your influencer based on niche, platform, followers, gender and country and scroll through the suggested influencers and the best one for your brand. All influencers are hand-picked, to make sure they are genuine, has a high engagement and are trustworthy. All of this to ensure an overall great influencer marketing experience. And of course a high ROI. This is a bit of a no-brainer but some brands are making the mistake of purely posting content for the sake of posting. By providing value with your content, you make it much more attractive to share – and this is what will help your branding tremendously. If you start getting some traction in the form of social shares, it will encourage other people to share your content as well. This helps build up your reputation and as time goes, you’ll become a go-to source within your niche and that’s where the real magic happens. When you become a go-to source within your niche, people will start seeing you as a leader and authority will start to build up short after. Remember: Every piece of content should support your brand image, as this is what will help build your authority. If you have the brand language that allows it, sharing memes or funny content can be valuable as these often get a lot of shares. If it doesn’t, sticking to appealing headlines can work just fine for you. Learn what type of content your audience enjoys the most. Going back to your old content gives you an indication on what your audience enjoys, and what they enjoy slightly less. Learn from the past and make slight adjustments to the content you share to get the best possible results. A very effective way to create and share content that will be popular is by looking at your competitors. Look at their content and see what worked well for them and then carry out that into your own strategy to create even better content.